In the last year, territorial disputes in the oil rich South China Sea topped the list of security concerns in Southeast Asia. Our correspondent in Jakarta looks back at how a number of confrontational incidents at sea increased regional tensions, prompted a major diplomatic initiative and a renewed commitment by the United States to increase its military presence in Asia. In May, Vietnamese officials held a news conference accusing China of damaging an oil exploration vessel as part of a campaign of harassment to assert its claim to the entire South China Sea. The Philippines have also accused Chinese vessels of repeatedly intruding into areas they claim in the potentially oil-rich reserves under the sea. Symbolic protests against China followed. 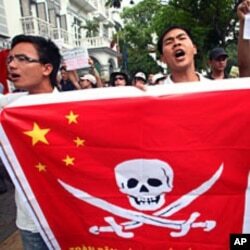 In Hanoi, a small group of demonstrators denounced China. And, lawmakers from the Philippines, including Representative Walden Bello, traveled to an island in the disputed region to protest China's claim. “For a just and peaceful solution in the end, we have to strongly assert our sovereign rights,” said Bello. Six countries hold conflicting claims in the South China Sea. But Bonnie Glaser, an analyst with the Center for Strategic and International Studies in Washington, says China's provocative actions and growing military strength has alarmed virtually every country in the region and has pushed many to reach out to the United States. Disputes in the South China Sea became a top priority issue at the Association of Southeast Asian Nations annual security summit in Bali in July," said Glaser. "ASEAN Chairman and Indonesian Foreign Minister Marty Natalegawa focused on developing a code of conduct with China. "There has been heightened concern and heightened tensions even on the South China Sea, at least in recent weeks," said Natalegawa. "But the difference between now and, perhaps last year, is that that concern, that attention, is being channeled hopefully to a problem-solving outlook." After intense talks there was a breakthrough, of sorts. China, which insists that these disputes be handled bilaterally, agreed to guidelines that would to lead to a code of conduct to settle disputes. Philippine Foreign Secretary Albert del Rosario responded by saying that, although he supported the agreement,he doubted that it would resolve anything. “So you are signing an agreement with [China]. It's supposed to be a code of conduct, but [China] is saying, on the other hand, that they own everything," del Rosario said. "So how do you exact your code of conduct from a partner to the transaction who says he owns everything?" Shi Yinhong, a professor of international studies at Renmin University in Beijing, says ASEAN did succeed in getting all sides to pull back a bit from confrontational stands. He says at the Bali meeting with the ASEAN security community, the restraint attitude of all the countries that participated eased the previous tense attitudes. U.S. Secretary of State Hillary Clinton also endorsed the agreement, but reiterated the U. S. position that all disputes be settled peacefully, in compliance with international law, and that freedom of navigation be protected. At the same time, the United States increased its military presence in the Asia Pacific region. In August, the U.S. Navy gave Vietnamese officials a very public tour of the USS George Washington nuclear aircraft carrier as it transited the South China Sea. On her way to the ASEAN-sponsored East Asia Summit in November, Clinton met with her Philippine counterpart aboard the USS Fitzgerald to reiterate America's support for its ally. "We are making sure that our collective defense capabilities and communications infrastructure are operationally and materially capable of deterring provocation,” said Clinton. And. on his way to the East Asia summit, President Barack Obama announced an agreement between Australia and the United States to station up to 2,500 American forces in Australia in the next few years. Although the U.S., China, and ASEAN heads of states publicly emphasized cooperation and friendship at November's East Asia Summit, behind closed doors most Southeast Asian leaders opposed China's bilateral position and supported multilateral efforts to develop a code of conduct. Professor Yinhong in Beijing says he blames increased U.S. military engagement in the region for turning ASEAN opinions against Beijing. He says, before the U.S. involvement, the same countries were on the same level of China and agreed to cooperate bilaterally. But now with U.S. involvement, he says there are some countries in the area that feel like they have received huge foreign assistance, and that encourages them to continue on these disputes. Although some progress has been made to develop a code of conduct in the South China Sea, CSIS analyst Glaser says China and ASEAN are still far from a substantial agreement that includes consequences for violations. Despite ongoing talks, she expects further incidents between China and its neighbors in the South China Sea, even as the United States increases its military presence in the region.